The Target Tracker component is responsible for tracking and sorting all Targets in range. The results of the component is a simple list of Target structs for use by other components, such as the FireController. This section will familiarize you with the Editor interface and options so you can get started right away. More detail on how this system is implemented is provided in the TargetTracker Code Reference section. Use -1 to hit all targets in range. One or more Unity Layers used to reduce the number of objects processed by the perimeter. Only GameObjects in these layers will be found and checked for a Targetable component. The layer the perimeter will be added to when it is created at run-time. The perimeter is created when the GameObject with this TargetTracker is instantiated. You are given this object because the perimeter uses a collider trigger and you may wish to add it to a layer that is ignored by other physics objects in your game. We recommend creating a layer in your game called "Perimeters". The shape of the area that will be used to detect targets in range. 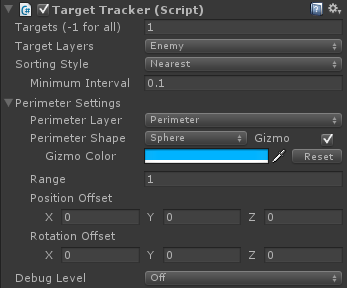 Use this to offset the position of the perimeter from the GameObject with this TargetTracker component. You can use the gizmo option to visualize what the perimeter will look like without running the game. Use this to offset the orientation of the perimeter from the GameObject with this TargetTracker component. You can use the gizmo option to visualize what the perimeter will look like without running the.